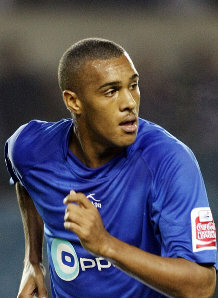 It could be like Springfield as Toon may be after Arsenal's Jay Simpson? | NUFC Blog. It could be like Springfield as Toon may be after Arsenal’s Jay Simpson? Maybe the players will trot out to the The Simpsons theme tune shortly as Jay may join Danny, if news that we’re interest in (Homer) Jay Simpson is accurate. SSN are reporting that he is set for a loan move away from Arsenal and they’ve had enquiries from both Premiership and Championship clubs. It’s understood that the promising young forward is wanted by QPR, Sheffield United, Swansea and of course, not forgetting the Toon. Simpson was on loan at West Brom last season, only scoring once in his 13 games but impressing nonetheless with ability and pace. Yet to make his league debut for Arsenal but having scored twice in three Carling Cup appearances, Wenger thinks highly of him but seems happy to let him gain more experience out on loan having spent a year at Millwall as well, where he score 7 goals in 41 games. So another unproven forward to come into the mix then? It’s a case of hit and miss with most new players but it would be more reassuring to get someone with experience and proven pedigree. However, beggars can’t be choosers and he can’t be bad if he’s still at The Emirates. If it’s to be believed and there’s a chance we can get him then bring it on because you can be damned sure we’ll lose a few more before the end of the month. Come to think of it, I wonder if Mr Burns is the money behind one of these American consortiums? Arsenal and Spurs want Newcastle’s next ‘big’ thing? Arsenal’s ‘Jack The Lad’ coming to Toon? Hoops for supper tonight – Newcastle v QPR match preview. Taylor, Taylor, Simpson, Simpson. The obsessive-compulsive in me likes that sort of symmetry, although they must mirror one another in positions on the pitch for it to be ideal. It put me in mind of Trumpton for some reason. And then we can get Ameobi’s little brother promoted to te first team, sorted! he is a good lad is homer jay simpson. he is honest, hard working, quick and strong. he is a player i would like to see playing more at the Emirates. i think he will do well at The Toon. give him some time as he is only young…..
that was technically, possibly the worst game of football ive ever saw last night!!! As i said, not a kick in the nads for the younguns, as they are a promising bunch, but i think people need a bit of a reality check some times and to maybe get their heads out of champ man, just hope it came last night!! Mick (4) I agree totally, and said as much in the previous article. You can do more harm than good by forcing them into the first team too soon, especially in numbers.